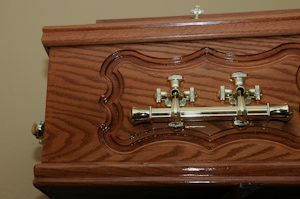 We stock a selection of fully furnished coffins which family members are welcome to view at our funeral home in Kealkill. These coffins are Irish made (mostly in Co Cork) and are crafted from a variety of woods and are in different styles and finishes. We also supply a range of caskets. We can also supply coffins which are 100% made from biodegradable materials. Please ask about our range. We will also do our best to accommodate special requests which a family may have. The cost of each coffin will be presented to the family before any decision is made about choice.